Boulder County values balancing a strong economy with protection of the environment and social equity. To promote prudent land and resource use, Boulder County is collaborating with local marijuana growers to help them reduce their environmental impacts while simultaneously reducing their costs. Currently, the light sources and cooling systems that are used to grow marijuana plants indoors have disproportionately increased electricity consumption, emissions, and electronic waste generation in Boulder County. Because the majority of electricity in Colorado comes from coal-fired power plants, the dirtiest source of power, Boulder County is taking steps to reduce the impact of this industry on the environment. The marijuana industry has high energy intensity, and has the potential to have a significant impact with regards to climate change. Boulder County is requiring commercial marijuana growers to either offset their electricity use with local renewable energy, which now includes RenewableConnect, or pay a 2.16 cent charge per kWh. The fee is being put into the Boulder County Energy Impact Offset Fund. This fund is being used to educate and encourage best marijuana cultivation practices with regards to energy usage as well as to fund other carbon offset projects such as the development of more renewable energy. This program is collecting high-quality energy usage data that will provide researchers the tools they need to develop the most efficient lighting and ventilation systems for this rapidly growing industry. The Board of County Commissioners authorized the creation of the Boulder County Energy Impact Offset Fund in Resolution 2014-41 and the Energy Impact Offset Fund Steering Committee was established in February of 2018. For more information on the Boulder County Energy Impact Offset Fund, view Marijuana Licensing and the Boulder County Marijuana Licensing Regulations. Boulder County has released phase one of the Energy Impact Offset Fund’s Demand Side Management Study. This study assesses the collective demand side management potential across the 12 cannabis facilities currently regulated by Boulder County. Policy actions are recommended to facilitate market forces to aid energy productivity improvements and distributed generation for the reduction of emissions in the cannabis industry. The average electricity consumption of a local 5,000 square foot indoor marijuana facility is about 41,808 kilowatt-hours monthly, while the average consumption for commercial use of that space is 5,750 kilowatt-hours monthly. For comparison, the average electrical consumption of a local household in Boulder County is about 630 kilowatt hours monthly. Since the majority of this electricity comes from coal burning power plants, a typical 5,000 square foot indoor grow facility contributes approximately 43,731 pounds of carbon dioxide (CO2) per month to the atmosphere. Of that, 66% was indoor cultivation and 30.9% was in greenhouses. 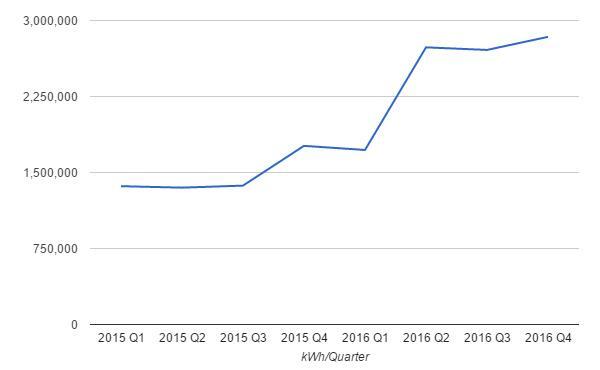 Electrical energy consumption increased from 5.8 Million kWh in 2015 to more than 10 Million kWh in 2016, a 71% increase. This is equivalent to the electrical consumption of over 1,300 households. The industry is still rapidly expanding with existing facilities being made larger, and new facilities being built. Boulder County regulated cannabis cultivation and processing facilities are collectively consuming 49,291 kWh per day. The electrical energy intensity of these facilities varies between 0.203 and 0.580 kWh/sqft/day, a variation of 186%. The average intensity through the rest of the commercial sector is 5 to 15 times lower. These facilities have a collective daily peak load of 2,983 kW (2.983 megawatts)** *** As of 2010 the entire City of Boulder had an annual peak load of 236,000 kW, so this small group of facilities is equivalent to over 1% of that, which is a large marginal effect for grid managers. The peak electrical power intensity of these facilities varies between 0.0104 and 0.0309 kW/sqft/day, a variation of 197%. These metrics don’t include the impact of cannabis facilities within the city limits of Boulder and other incorporated municipalities within the County. There are far more facilities within those jurisdictions. Both total energy and peak power will increase during the summer. * These statistics include facilities that were regulated by Boulder County at the beginning of 2016, but were annexed into the City of Boulder in November of 2016. These figures do not include other facilities that have been consistently within the incorporated boundaries of the cities within Boulder County. ** The timing of these peak power draws is still under analysis, but many are concurrent. ***“Energy” is “power” use over time. The amount of energy use drives system cost via fuel use and wear and tear, while the peak power needed drives costs in the amount of grid capital equipment needed to instantaneously meet that need. Both effects affect emissions. Boulder County has made anonymized electrical energy use data available to the public in an effort to support the marijuana industry in learning more about their energy impact and spurring innovation around best energy practices. This data has been collected from Boulder County cultivators and then stripped down to only include time stamps and average power across 15-minute intervals, allowing the identity of Boulder County cultivators to be protected. If you have any questions, please contact Brad Smith. Plan review services for building permits are not available on Tuesdays. Building permits can be applied for and issued until 4 p.m.